Figure 1. Severe Phomopsis seed decay. Photo Credit: Craig Grau, University of Wisconsin-Madison. As we finish off 2018 and look ahead to the 2019 planting season, soybean farmers need to be prepared for some potential seed quality issues. The 2018 crop was plagued by several problems, but one of the most substantial was a large amount of white, chalky, or black, and damaged seed (Figure 1). This damaged seed is impacting germination rates of soybean seed slated for the 2019 crop. Most of this damage is a result of infection and colonization by a group of fungal species called Diaporthe. This group is implicated in diseases such as stem canker, pod and stem blight (Figure 2), and Phomopsis seed decay (Figure 3). Excessive rains at the end of August and throughout September and October resulted in a large amount of pod infection by Diaporthe. These infections combined with delayed harvest allowed for extensive seed colonization by these fungi. This resulted in Phomopsis seed decay which has led to visually damaged seed and the germination issues we are now seeing. To learn more about this group of fungi and the diseases they cause, visit the Crop Protection Network (CPN) website on pod and stem blight and Phompsis seed decay by clicking here. You can also download a PDF version of the CPN fact sheet on the same subject by clicking here. How Do I manage this Problem at Planting in 2019? Soybean seed producers should try to clean seed to achieve less than 20% damaged seed in a seed lot. Multiple cleaning steps might be needed to achieve this level. While testing germination now is recommended, remember that testing germination again next spring and potentially just prior to delivery will also help you to understand the germination rate and determine if other management strategies need to be employed such as fungicidal seed treatments. Seed treatments can help improve the germination rate of seed damaged by Diaporthe. However, you will need more than metalaxyl or mefonoxam active ingredients in your seed treatment. Metalaxyl and mefonoxam are good against Phytophthora and Pythium, but not effective against other organisms, like Diaporthe. Seed treatments with Phomopsis on the label have an additional fungicide (either a DMI or SDHI). Page 157 of the publication A3646 – Pest Management in Wisconsin Field Crops has a table of some of the seed treatments with Phomopsis on the label. Also available is the seed treatment efficacy table from the Crop Protection Network (CPN). You can download that publication by clicking here. Figure 3. Damaged soybean seed as a result of Diaporthe infection. We also recommend that as a farmer, you double check the percent germination on every seed lot prior to planting and adjust your seeding rates accordingly. Here are our recommendations for soybean seeding rate based on yield potential and white mold risk: The Soybean Seeding Rate Conundrum. If I’m a Seed Producer, What Should I Do to Prevent this Problem Next Year? Foliar fungicide applications during the growing season could reduce the damage from Diaporthe. Some work has demonstrated that fungicide applications between the R3 to the R5 growth stages might be useful in reducing damage. This might help improve seed quality, but not necessarily improve yield. For a list of fungicide products with efficacy ratings for soybean, take a look at this additional publication from the CPN by clicking here. 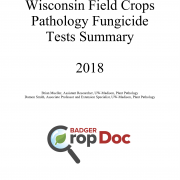 Each year the Wisconsin Field Crops Pathology Program conducts a wide array of fungicide tests on alfalfa, corn, soybeans, and wheat. These tests help inform researchers, practitioners, and farmers about the efficacy of certain fungicide products on specific diseases. 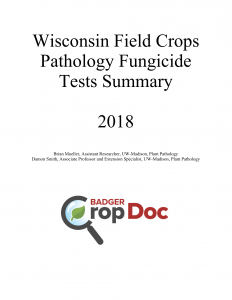 The 2018 Wisconsin Field Crops Fungicide Test Summary is now available. These tests are by no means an exhaustive evaluation of all products available, but can be used to understand the general performance of a particular fungicide in a particular environment. Keep in mind that the best data to make an informed decision, come from multiple years and environments.  To find fungicide performance data from Wisconsin in other years, visit the Wisconsin Fungicide Test Summaries page. You can also consult publication A3646 – Pest Management in Wisconsin Field Crops to find information on products labeled for specific crops and efficacy ratings for particular products. Additional efficacy ratings for some fungicide products for corn foliar fungicides, soybean foliar and seed-applied fungicides, and wheat foliar fungicides can be found on the Crop Protection Network website. Mention of specific products in these publications are for your convenience and do not represent an endorsement or criticism. Remember that this is by no means a complete test of all products available. You are responsible for using pesticides according to the manufacturers current label. 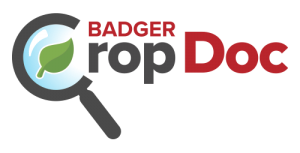 Some products listed in the reports referenced above may not actually have an approved Wisconsin pesticide label. Be sure to check with your local extension office or agricultural chemical supplier to be sure the product you would like to use has an approved label. Follow all label instructions when using any pesticide. Remember the label is the law! 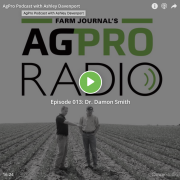 Dr. Damon Smith, or @badgercropdoc, is an extension specialist and associate professor at the University of Wisconsin, Madison. We’re talking about different agronomic issues farmers have faced this year, including a newer one: tar spot. You can listen to the Podcast here. Figure 1. 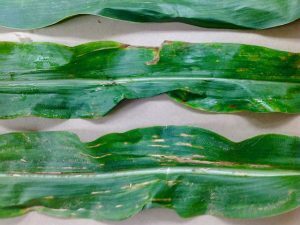 Symptoms of bacterial leaf streak on corn. The 2018 corn production season in Wisconsin has been challenging to say the least. We had what looked to be some of the best corn production we ever had, and then the diseases started to move in. 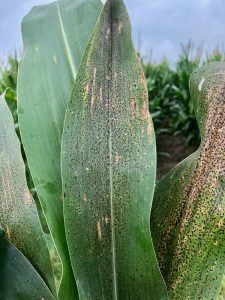 We have observed numerous foliar disease issues and have spent a lot of time trying to understand the tar spot epidemic in Wisconsin and surrounding states. To add insult to injury, we have now confirmed bacterial leaf streak (BLS) of corn. You may remember that we have been on the lookout for this disease over the past several seasons, but have not confirmed it officially in the state until now. A corn sample was received in our Plant Disease Diagnostic Clinic this season from Pierce County with symptoms consistent with those for BLS (Fig. 1). The sample was confirmed positive in our clinic through multiple tests, including bacterial streaming and PCR. Subsequently, the sample has been confirmed positive by multiple laboratories, including the CPHST-Beltsville Laboratory. 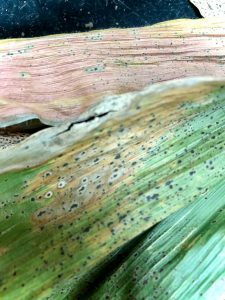 Bacterial leaf streak (BLS) of corn was reported for the first time on corn in the U.S. in 2016, but was likely present in Nebraska since 2014. The first report was in Nebraska with subsequent reports coming in from other states in the U.S. corn belt. Other states where the disease has been confirmed include Iowa, Illinois, Colorado, Kansas, Minnesota, Oklahoma, South Dakota, Texas, and now Wisconsin. What causes bacterial leaf streak and what are the symptoms? Bacterial leaf streak is caused by a bacterium named Xanthomonas vasicola pv. vasculorum. It causes wavy narrow leaf lesions with wavy edges that are often brown in color. Lesions can appear translucent and have halos when backlit. Symptoms on corn have been observed as early as V7, starting in the lower canopy and moving up the canopy if weather conditions are favorable (wet weather, with hot temperatures). 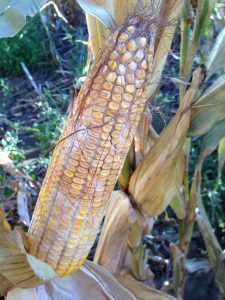 Little is known about the disease cycle, but researcher believe it can overwinter on corn residue. The bacterium is presumed to be spread by irrigation, splashing rain, or wind-driven rain. No injury is needed for the bacterium to enter the plant. It is unknown if the bacterium can be spread on, or in, seed and if there are alternative weed hosts. 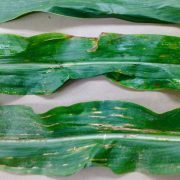 Does bacterial leaf streak cause yield loss? Little is actually known about the disease on corn in the U.S. Most researchers believe that yield loss is minimal if the disease moves in late in the season. If the disease moves in earlier and causes extensive leaf blighting during grain fill, then yield losses could be more substantial. Little is known about the effect of BLS on grain quality. 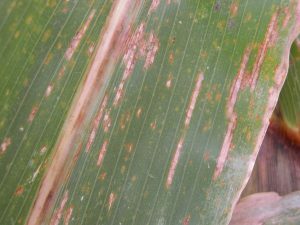 How do I manage bacterial leaf streak of corn? Some corn hybrids appear to have better resistance to BLS than others. Work with your seed dealer to find a hybrid that is rated as resistant and fits your environment. 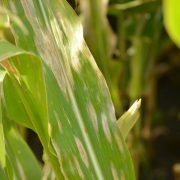 Hybrid resistance will be key to manage this disease. BLS is caused by a bacterium, thus, fungicides are not effective in controlling this disease. Withholding irrigation has also been shown to not be effective as the disease can occur in drylands and irrigated fields. 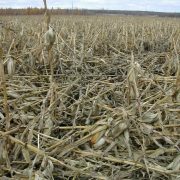 Managing corn residue through rotation may be helpful. Tillage and burying residue might also be an option, but managing soil erosion should be placed as a higher priority. You can click here to read the USDA APHIS Statement on Xanthomonas vasicola pv. vasculorum. To learn more about the disease and to watch a video by Dr. Tamra Jackson-Ziems at the University of Nebraska CLICK HERE. To learn how BLS is diagnosed in the lab, CLICK HERE to watch a video from Iowa State University. CLICK HERE to download a fact sheet on BLS of corn, by a team of U.S. plant pathologists. How do I get a diagnosis if I suspect bacterial leaf streak? 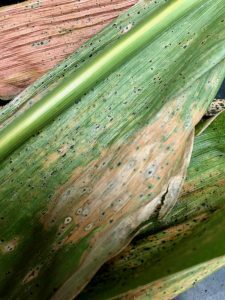 If you suspect that you have BLS in your corn crop in Wisconsin, leaf samples of corn plants can be sent in a sealed plastic bag with NO added moisture to the University of Wisconsin Plant Disease Diagnostic Clinic (PDDC). Information about the clinic and how to send samples can be found by CLICKING HERE. 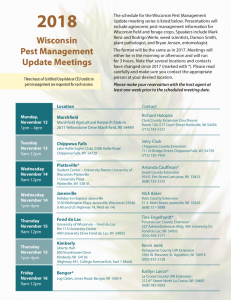 The schedule for the Wisconsin Pest Management Update meeting series has been set. 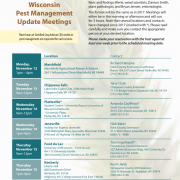 Presentations will include agronomic pest management information for Wisconsin field and forage crops. Speakers include Mark Renz and Rodrigo Werle, weed scientists, Damon Smith, plant pathologist, and Bryan Jensen, entomologist. The format will be the same as in 2017. Meetings will either be in the morning or afternoon On November 12-16, 2018. Simply choose a day/location to attend with each meeting running 3 hours. Note that several locations and contacts have changed since 2017 (marked with * in the meeting flier). Please read the informational flier carefully and make sure you contact the appropriate person at your desired location. Integrated Pest Management Updates in corn, soybeans, alfalfa, and small grains: Update on new products and/or use of existing products as well as brief highlights of the 2018 pest situations in each crop. Please make your reservation with the host contact at least one week prior to the scheduled meeting date. Three hours of Certified Crop Advisor CEU credits in pest management are requested for each session. To download a PDF of the flier, CLICK HERE. The calls have been coming in this past week on a couple of soybean diseases. In the southern third of the state most of the calls have centered on sudden death syndrome or SDS. 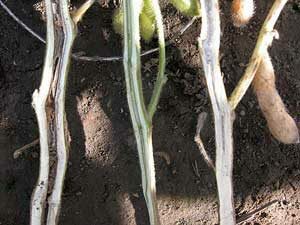 To the north, most questions pertain to Sclerotinia stem rot or white mold. I’ll discuss SDS in some detail, plus provide a detailed description of brown stem rot (BSR) which also typically shows up this time of year. Finally I’ll provide a brief update on the white mold situation. The first noticeable symptoms of SDS are chlorotic (i.e., yellow) blotches that form between the veins of soybean leaflets. These blotches expand into large, irregular, chlorotic patches (also between the veins), and this chlorotic tissue later dies and turns brown. Soon thereafter entire leaflets will die and shrivel. In severe cases, leaflets will drop off leaving the petioles attached. 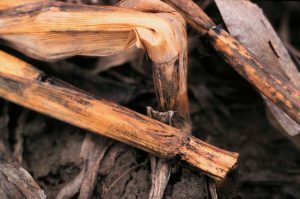 Taproots and below-ground portions of the stems of plants suffering from SDS, when split open, will exhibit a slightly tan to light brown discoloration of the vascular (i.e., water- conducting) tissue. The pith will remain white or cream-colored. In plants with advanced foliar symptoms of SDS, small, light blue patches will form on taproots and stems below the soil line. These patches are spore masses of the fungus that causes the disease. Foliar symptoms of SDS can be confused with those of brown stem rot. However, in the case of brown stem rot (BSR), the pith of affected soybean plants will be brown. In addition, roots and lower stems of plants suffering from BSR will not have light blue spore masses. Once symptoms of SDS are evident, yield losses are inevitable. 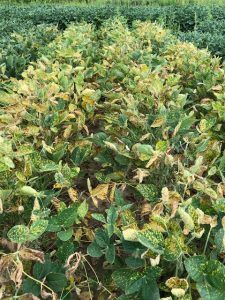 Yield losses can range from slight to 100%, depending on the soybean variety being grown, the plant growth stage at the time of infection and whether or not SCN is present in a field. If SDS occurs after reproductive stages R5 or R6, impact on yield is usually less compared to the development of SDS at flowering that can lead to substantial yield losses. When SCN is present, the combined damage from both diseases can be substantially more than the sum of the damage expected from the individual diseases. SDS is caused by the soilborne fungus, Fusarium virguliforme (synonym: F. solani f. sp. glycines). F. virguliforme can overwinter freely in the soil, in crop residue, and in the cysts of SCN. 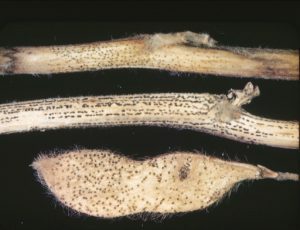 The fungus infects soybean roots (by some reports as early as one week after crop emergence), and is generally restricted to roots as well as stems near the soil line. F. virguliforme does not invade leaves, flowers, pods or seeds, but does produce toxins in the roots that move to the leaves, causing SDS’s characteristic foliar symptoms. SDS cannot be controlled once plants have been infected. Foliar fungicides have NO effect on the disease.Recently a new seed treatment has been identified that has efficacy against SDS. The active ingredient fluopyram can be found in the seed treatment iLeVo and is rated “very good” in multi-state trials. Other methods of control include using SDS-resistant varieties whenever possible in fields with a history of the disease; however, keep in mind that SDS-resistant varieties with maturity groups suitable for Wisconsin and other northern regions (groups I and II) can be limited. If SDS and SCN are both problems in the same field, planting an SCN-resistant soybean variety may also be beneficial in managing SDS. Do not delay planting soybeans to avoid symptoms of SDS. 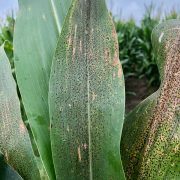 In Wisconsin, it has been demonstrated that the benefits to yield when planting early outweigh the benefits of reduced SDS symptoms if planting is delayed. Improve soil drainage by using tillage practices that reduce compaction problems. Rotation, while useful in managing other soybean diseases, does not appear to significantly reduce the severity of SDS. Even after several years of continuous production of corn, F. virguliforme populations typically are not reduced substantially. 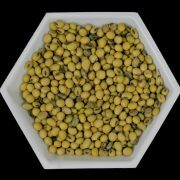 Research from Iowa State University has shown that corn (especially corn kernels) can harbor the SDS pathogen. For more information CLICK HERE to download a full color fact sheet on SDS. A short video on SDS can also be viewed by CLICKING HERE. Symptoms of BSR in soybean stems compared with a healthy soybean stem in the center. 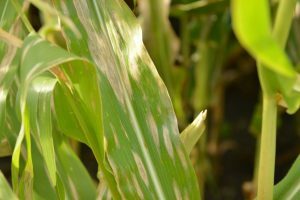 Symptoms of BSR are usually not evident until late in the growing season and may be confused with signs of crop maturity or the effect of dry soils. The most characteristic symptom of BSR is the brown discoloration of the pith especially at and between nodes near the soil line. This symptom is best scouted for at full pod stage. Foliar symptoms, although not always present, typically occur after air temperatures have been at to below normal during growth stages R3-R4, and often first appear at stage R5, peaking at stage R7. Foliar symptoms include interveinal chlorosis and necrosis (i.e., yellowing and browning of tissue between leaf veins), followed by leaf wilting and curling. Yield loss as a result of BSR is generally greatest when foliar symptoms develop. The severity of BSR symptoms increases when soil moisture is near field capacity (i.e., when conditions are optimal for crop development). Foliar symptoms of BSR can be confused with those of sudden death syndrome (see description below). However, in the case of sudden death syndrome (SDS), the pith of affected soybean plants will remain white or cream-colored. In addition, roots and lower stems of plants suffering from SDS (but not those suffering from BSR) often have light blue patches indicative of spore masses of the fungus that causes SDS. BSR is caused by the soilborne fungus Cadophora gregata. There are two distinct types (or genotypes) of the fungus, denoted Type A and Type B. Type A is the more aggressive strain and causes more internal damage and plant defoliation than Type B. P. gregata Type A also is associated with higher yield loss. 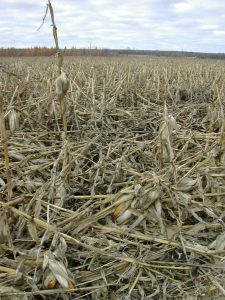 P. gregata survives in soybean residue, with survival time directly related to the length of time that it takes for soybean residue to decay. 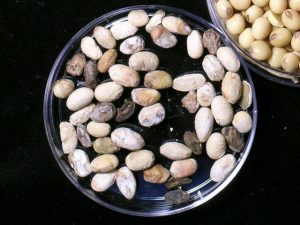 Thus, P. gregata survives longer when soybean residue is left on the soil surface (e.g., in no till settings) where the rate of residue decay is slow. P. gregata infects soybean roots early in the growing season. It then moves up into the stems, invading the vascular system (i.e., the water-conducting tissue) and interfering with the movement of water and nutrients. Several factors can influence BSR severity. Research from the University of Wisconsin has shown that the incidence and severity of BSR is greatest in soils with low levels of phosphorus and potassium, and a soil pH below 6.3. In addition, C. gregata and soybean cyst nematode (Heterodera glycines) frequently occur in fields together, and there is evidence that BSR is more severe in the presence of this nematode. BSR cannot be controlled once plants have been infected. Foliar fungicides and fungicide seed treatments have NO effect on the disease. Use crop rotations of two to three years away from soybean with a non-host crop (e.g., small grains, corn, or vegetable crops), as well as tillage methods that incorporate plant residue into the soil. Both of these techniques will help reduce pathogen populations by promoting decomposition of soybean residue. Also, make sure that soil fertility and pH are optimized for soybean production to avoid overly low phosphorus and potassium levels, as well as overly low soil pH. 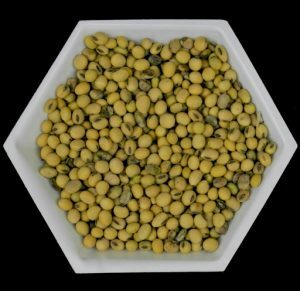 Finally, grow soybean varieties with resistance to BSR. Complete resistance to BSR is not available in commercial varieties. However several sources of partial resistance that provide moderate to excellent BSR control are available. Also, some, but not all, varieties of soybean cyst nematode (SCN) resistant soybeans also are resistant to BSR. Most soybean varieties with SCN resistance derived from PI 88788 express resistance to BSR. However, the same is not true of varieties with SCN resistance derived from Peking. Therefore growers should consult seed company representatives about BSR resistance when selecting a variety with SCN resistance derived from this source. You can download a full color fact sheet on BSR by clicking here. You can also CLICK HERE to view a short video on BSR. Symptoms of white mold are becoming pretty apparent in Wisconsin. White fluffy growth (mycelium) is readily evident. Incidence in the northern half of the state is higher. We have visited fields as far north as Wausau and Pulaski, Wisconsin and have observed incidence ranging from 0% to 30% of plants infected. Reports from areas in the northwest indicate white mold present, but not as high of incidence levels. As we move to the southern portion of Wisconsin, white mold can be found, but at reasonably low levels. Most of the soybean crop is at the R5 growth stage, with some earlier maturing fields approaching R6. Questions have arisen about spraying fungicide now to reduce the damage caused by white mold and preserve yield. The short answer is NO. 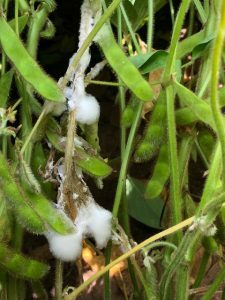 The reason is that the primary means of infection by the white mold fungus is through soybean flowers. These infections happened weeks ago. Therefore, the optimal time to spray would be when flowers were out. A low level of plant-to-plant transmission can occur late in the season in soybeans. However, this rate is low enough, that spraying to prevent it does not produce favorable results. 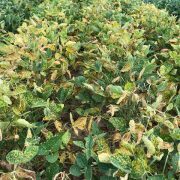 How much soybean yield might I lose from white mold? Research has demonstrated that for every 10% increase in the number of plants that are infected with white mold at the R7 growth stage, you can expect between 2 to 5 bushels of yield loss. Thus, the fields I mentioned earlier will likely range from little detectable yield loss (3% incidence) to as high as 10 bushels lost (20% incidence). 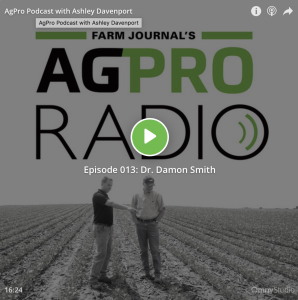 What should I do if I see white mold in my soybean field now? Get out and survey your fields for white mold. It is a good idea to determine how much white mold you have in your fields, so you can make some educated harvest decisions. One way to move white mold from one field to the next is via combines. You could clean your combine between each field, but this can be time consuming. So by determining which fields have no white mold and which fields have the most white mold, you can develop a logical harvest order by beginning your harvest on fields with no white mold and working your way to the heavily infested fields. This will help reduce spread of the white mold fungus to fields that aren’t infested. You can also make some decisions on your rotation plan and future soybean variety choices based on these late season observations. If you would like to learn more about white mold and management of this disease, CLICK HERE to download a fact sheet from the crop protection network. You can also watch a short video about white mold by CLICKING HERE. Map Legends: No color = model is inactive and risk of apothecia in the field is not likely; Gray = apothecia might be present, but likelihood of apothecial presence is extremely low; Blue = low risk of apothecia; Yellow = medium risk of apothecia in the field; Red = high risk of apothecia in the field. Model predictions must be combined with soybean growth stage and canopy characteristics to aid in timing of fungicide sprays. Cooler, dry weather has changed the white mold risk map over the last several weeks for non-irrigated (dryland or rain-fed) soybean fields (Figure 1). Cool weather has generated some areas of high risk in the southwest, western, and north-central regions of the state. However, the dry conditions have dissipated much of the moderate and low risk areas that showed several weeks ago. Risk in general is much more spotty than it has been. The soybean crop is also moving through growth stages much more rapidly than in 2017. Thus, the risk window for infection by the white mold fungus will end soon. Remember that once the crop has finished flowering risk of new infections is low to non-existent. In addition, late applications (R4 and later growth stages) of fungicide will not be needed for white mold control. Risk remains high across much of the state for irrigated soybeans planted to 15″ rows (Figure 2). Risk is starting to dissipate in areas in the east-central region, due to dryer conditions. However, a fungicide application should be considered if irrigating and soybeans are flowering and planted to a 15″ row-spacing. Note that if you have irrigation in your field but are not actually irrigating, you should be using the non-irrigated model above to make an accurate prediction of white mold risk. Risk of white mold in irrigated fields planted to 30″ row-spacing has decreased a bit in some areas, since the last post (Figure 3). However, Much of the state is at risk if irrigating on 30″ spaced soybeans. In these areas, a fungicide application should be considered if soybeans are being irrigated, canopy is nearly closed, and flowers are present. Note that if you have irrigation in your field but are not actually irrigating, you should be using the non-irrigated model above to make an accurate prediction of white mold risk. 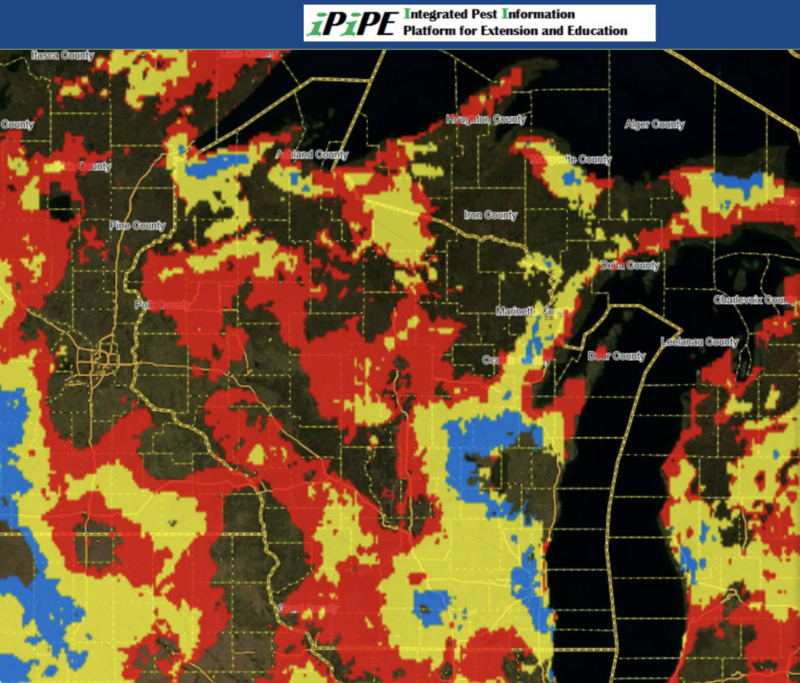 These models were developed at the University of Wisconsin-Madison in conjunction with Michigan State University and Iowa State University to identify at-risk regions which have been experiencing weather favorable for the development of white mold fungus apothecia. 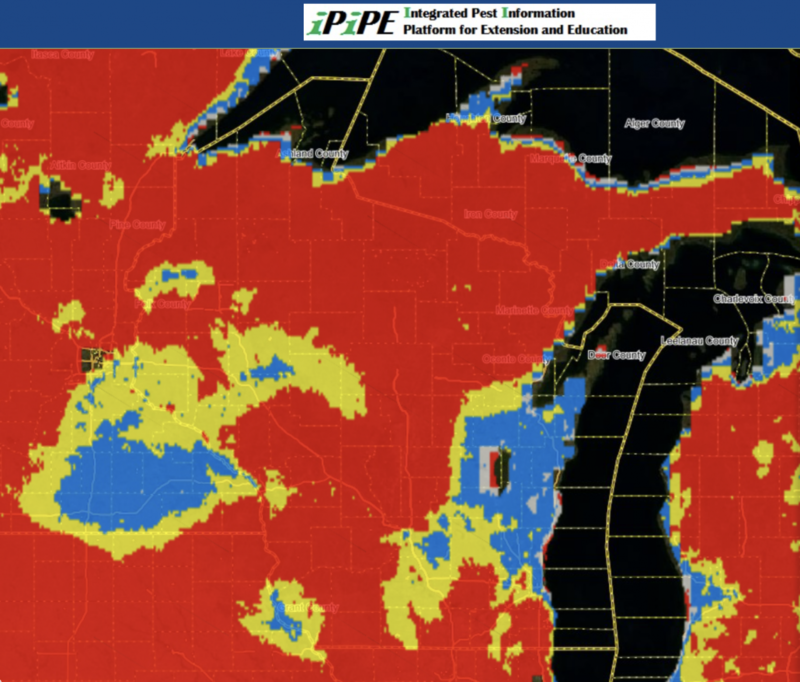 Weather information and maps are provided by the Soybean Integrated Pest Information Platform for Extension and Education (iPIPE), which is managed by ZedX, Inc. These models predict when apothecia will be present in the field using combinations of 30-day averages of maximum temperature, relative humidity, and maximum wind speed. Using virtually available weather data, predictions can be made in most soybean growing regions. Based on these predictions, a map is generated under three scenarios (non-irrigated soybeans, soybeans planted on 15″ row-spacing and irrigated, or soybeans planted on 30″ row-spacing and irrigated). The maps are colored to show the likelihood of apothecial presence within a region. 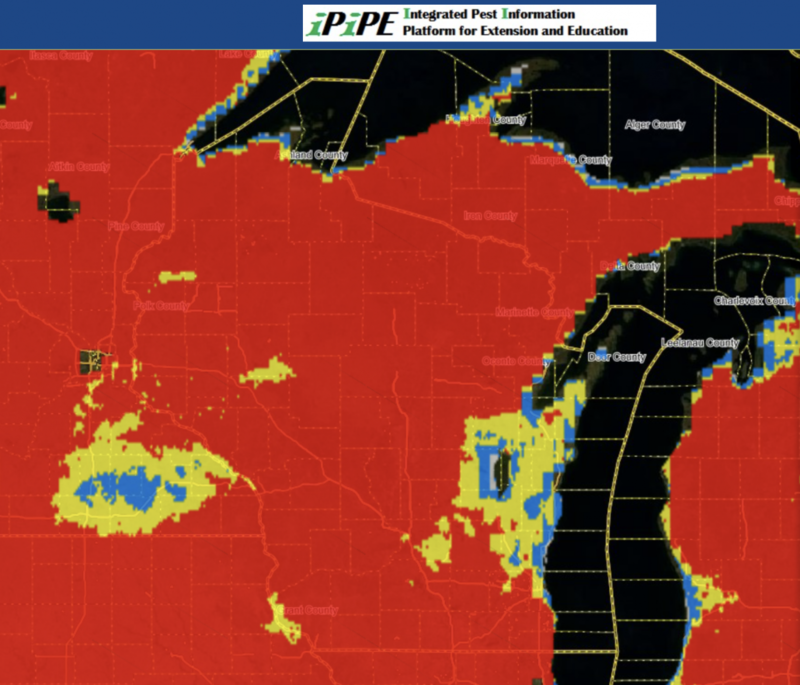 If the model is predicting high risk (red) in your area for your planting scenario, the soybeans are flowering, and the canopy is somewhat closed, then the white mold risk is high. If your fields are at-risk, we recommend to consult your local extension personnel or other research-based resources for the best in-season management options for your area.